Rawdog was present when the original OverLord became the victim of an assassination attempt. He and some of his colleagues had been suggesting that OverLord give up some of his power within the Vicious Circle when FirePower made a failed attempt on his life. Rawdog was later sent by OverLord along with several other villains to murder CyberFace whilst he was in the custody of the Chicago Police Department. This group were arrested and sent to prison. Rawdog tried to escape from Stronghold Penitentiary during the Gang War but was halted due to the intervention of several heroes led by Dragon. He would remain incarcerated for a couple more years until miniaturised Vicious Circle members broke him loose. Rawdog was then present as Dragon and rebel Vicious Circle villains eliminated Horde. 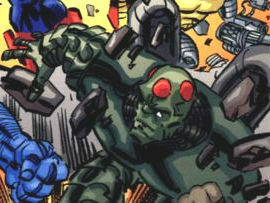 Years later, Rawdog had remained with the Vicious Circle and became one of those villains that were apprehended by the Billy Berman Mighty Man. These prisoners broke loose thanks to the intervention of heroes led by SuperPatriot. Later still, Rawdog took part in the raid on Hillman Hospital where a unit of Dragon’s blood was stolen, leading to the eventual creation of the doomed Dragon Army. Rawdog is murdered by Dart II during her raid on a VC warehouse.